Pope Benedict XVI has expressed "full and indisputable solidarity" with Jews, distancing himself from a bishop who denies the Nazis used gas chambers. Briton Richard Williamson was among four bishops whose excommunications were lifted by the Pope last week. 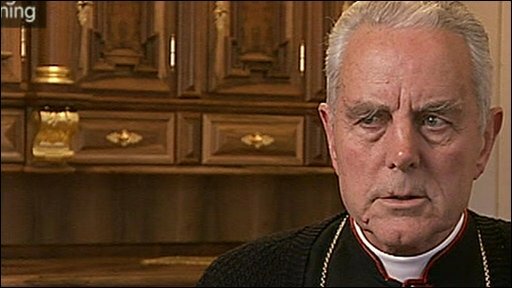 Bishop Williamson said recently: "I believe there were no gas chambers". Jewish leaders, marking Holocaust Remembrance Day, reacted angrily to the rehabilitation of the bishop, saying it had harmed Catholic-Jewish dialogue. The Pope told a Vatican audience on Wednesday the Holocaust "should be a warning for all against forgetting, denial and reductionism". "While I renew with affection the expression of my full and unquestionable solidarity with our [Jewish] brothers, I hope the memory of the Shoah [Holocaust] will induce humanity to reflect on the unpredictable power of hate when it conquers the heart of man," he said. But Nobel Peace Prize winner and death camp survivor Elie Wiesel said that the Pope, by lifting the excommunication of the British-born cleric, had given credence to "the most vulgar aspect of anti-Semitism". "What does the Pope think we feel when he did that?" he asked. "That a man who is a bishop and Holocaust denier - and today of course the most vulgar aspect of anti-Semitism is Holocaust denial - and for the Pope to go that far and do what he did, knowing what he knows, is disturbing," he told the Reuters news agency. Mr Wiesel agreed with other Jewish leaders who said the episode could be a setback in the fight against anti-Semitism. "One thing is clear: this move by the Pope surely will not help us fight anti-Semitism. Quite the opposite," he said. On Tuesday, the Chief Rabbinate of Israel - the supreme Jewish governing body in the country - broke off official ties with the Vatican in protest over the Pope's decision. Haifa Chief Rabbi Shear Yishuv Cohen, chairman of the Rabbinate's commission, told The Jerusalem Post that he expected Bishop Williamson to publicly retract his statements before links could be renewed. 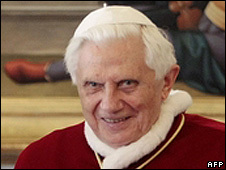 "I understand the Pope's efforts to bring about unity in the Church, but he should be aware that, indirectly, he hurt Jews. We expect him to do the best to repair the situation," he told the paper. Vatican spokesman Father Federico Lombardi said that following the Pope's words at the audience, he hoped the Chief Rabbinate of Israel would re-think its position and continue "fruitful and serene dialogue". France's Europe Minister, Bruno Le Maire, said he was "deeply upset" by the Pope's action. "I believe that it was a mistake and for a Catholic such as myself, this is something that is difficult to understand," he said. The four bishops whose excommunications were lifted are members of the Society of St Pius X, which was founded by a French archbishop, Marcel Lefebvre, in 1970 as a protest against the Second Vatican Council's reforms on religious freedom and pluralism. The late Archbishop Lefebvre made them bishops in unsanctioned consecrations in Switzerland in 1988, prompting the immediate excommunication of all five by the late Pope John Paul II. The Vatican said the four men had been asked to recognise the authority of the Pope and the Second Vatican Council, and that future talks would seek to resolve the "open questions" in the Church's relationship with the Society of St Pius X.